This photo will open full-size in a new window when clicked. First of all, I love the composition of the picture. it pulls your eyes down the tracks to the light at the end -- very nice effect. And then the four different tones are so cool. Well done! What cool pictures. The tones are incredible and you picked the perfect picture for the effects! What did we do before photoediting software? Very nice. All you need are a few hundred more for the Warhol Look. It looks like 4 different photos ! Very beautiful !! Some ideas are so obvious when you see them but you would never think of them in a million years. Great idea Andrée. That is an interesting study. I think my favorite is the color photo because I like the delicate shade of blue. It's a lovely view and it's nice how you made it more interesting by incorporating different effects. 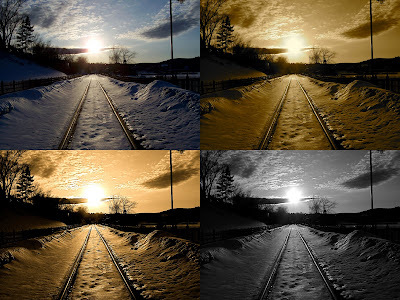 Beautiful set of photographs with different effects. Great idea. Nicely done! I had thought of doing something similar. Instaed I did something different. Very different composition, I love it! I like to learn more about my camera and photo software so I can have different effects on my pictures. I'm having trouble getting things posted today and hope soon I can get them posted.